Notre Dame, fresh off winning an 82-68 one vs two matchup vs Louisville, takes on Wake Forest at home Sunday afternoon. The Demon Deacons are currently winless in the ACC (0-2) and 9 - 6 overall. Wake’s conference losses are to Miami by 15 and by 1 vs. Boston College. Both games were played in Winston-Salem. Wake Forest averages 61.2 points per game. They make 40.2% of their field goal attempts overall, but just 29.1% from beyond the arc. They average 4.5 made threes, 13.1 assists and 18.9 turnovers per game. Their assist to turnover ratio is 0.7. They only force 13.1 turnovers per contest. The Wake Forest line-up features five international players including three starters. Four of their starters log long minutes — averaging between 33 1/2 to 36 minutes per game. Wake Forest is not used to playing before large crowds. Their two conference home games to start the season only attracted 704 and 467 fans. Elisa Penna, a 6’3” senior forward from Italy leads the team in scoring at 15.4 points per game. She also averages 6.0 rebounds. Penna shoots 35.0% from the field and is the team’s leading three-point scorer with 28 makes on 92 attempts (30.4%). She makes 86.3% of her free throw attempts. Alex Sharp, a 6’1” junior from Australia, averages 12.7 points and 8.7 rebounds per game. Ivana Raca, a 6’2” sophomore from Serbia, averages 12.5 points and 6.5 rebounds per game. She’s taken the second most three-point attempts on the team but only connects on 27.1% of her attempts. Ona Udoh is a 6’1” junior, who averages 11.0 points (61.2% from the field) and 9.2 rebounds per game. She has blocked 28 shots so far this season. Running the point for the Deacons is 5’10” sophomore guard, Gina Conti. She averages 7.0 points and 5.4 assists per game. Her assist to turnover ratio is 1.3. The top reserves — based on minutes played per game — appear to be Kaylen Dickson, a 5’11” freshman guard, and Ellen Hahne, a 5’11” freshman from Sweden. Wake Forest’s RPI rating has slipped to 105 — they had been inside the top 100 until their most recent loss to BC. Their strength of schedule is 56. ND remains atop the RPI ratings and has the number one strength of schedule in the NCAA. Irish Notes: Arike Ogunbowale’s 30 point effort against Louisville was the fifth time this season she’s scored 30 or more. Ogunbowale only had four points at halftime, and just 11 by the end of the third quarter when she hit a three-point shot just before the quarter ended. 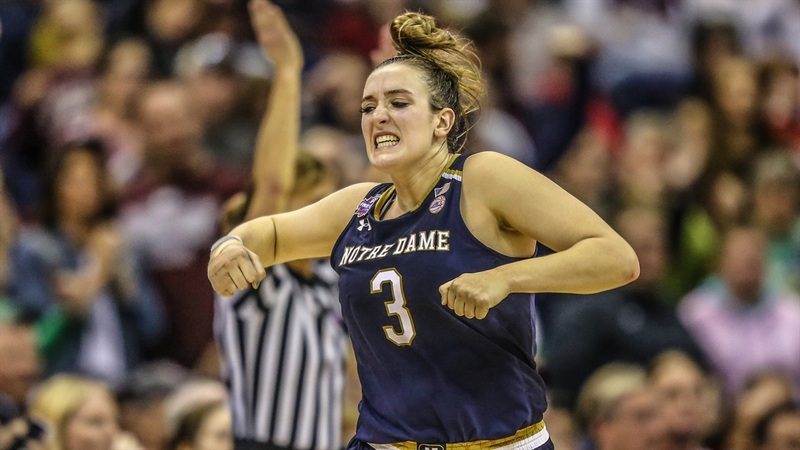 After shooting one for seven in the first half, she made her last six shots from the field including a three-pointer to extend the Irish lead to seven with 40 seconds remaining -- three possessions after Louisville had pulled to within two points with a little over two and half minutes left in the game. She scored 19 of ND’s 25 fourth quarter points. Ogunbowale hit all 12 of her free throw attempts — ten in the second half. During the game, she surpassed Katryna Gaither to move into the third spot in all-time scoring at Notre Dame. She’s now scored 2,138 points, just 184 behind Beth (Morgan) Cunningham and 219 behind Skylar Diggins-Smith. Ogunbowale is averaging 22.6 points per game for the season, but her per game average has slipped a bit to 20.9 over the past eight games. If her current scoring trend holds, she’ll pass Morgan-Cunningham on the road against Miami and Diggins-Smith two games later at BC. Ogunbowale averaged 24.3 points per game over the first eight games of the season. She averaged 19.8 shots per game with an overall field goal percentage of 43.7% and just 28.2% from three. She also hit 76.3% of her free throws in the first half of the season. Over the last eight games, Ogunbowale’s shots per game are down to 13.6 and her scoring average has dipped to 20.9 points. However, her shooting has improved to 56.9% from the field including 34.8% from three and her free throw shooting is up to 85.4%. Ogunbowale has not only become a more efficient scorer as she’s taken a third fewer shots per game over the second half of the season, she has also upped her playmaking. Her assists per game are up to 5.3 from 3.6 and her assist to turnover ratio is 1.9 over the last eight games vs 1.5 in the first eight combined. A few final notes on the Louisville game — while the Cardinals held ND to 82 points — 7 points below their season scoring average — and 44.6% from the field, the Irish limited Louisville to 68 points — 15.9 points below their per game average of 83.9 points. Louisville shot 38.2% from the field and just 20% from three. Their four made threes were down from their 7.4 per game average. The third quarter was again key for the Irish. After only scoring 13 points in the second quarter and hitting only 2 for 14 from the field (14.3%), the Irish scored 24 in the third quarter while shooting 56.3% from the field. Marina Mabrey started the scoring after halftime with a three-point basket and, as noted above, Ogunbowale hit a three just before the buzzer to extend the Irish lead to 10 points. ND shot 58.6% in the second half vs just 29.6% in the first half. Sunday’s game against Wake Forest is scheduled for a 1:00pm (eastern) tip-off. The game will be streamed live on ACCN Extra via the ESPN app. In-game updates will be posted below.